The scientists behind the atomic bomb knew their work would change the world forever. Built and tested in the deserts of the American West, the new class of weapons killed thousands of Japanese people, is said to have helped end World War II and certainly ushered in an age of unprecedented fear and distrust. But for the communities that made the bombs, more emphasis was placed on the new and much-needed economy than on the existential dread of the nuclear era. For those who want to probe deeper into this rich history, the Scienceline audio story “Atomic Town,” about my hometown Richland, Washington and others like it, is presented here alongside a radioactive road trip. They didn’t, of course, actually glow in the dark. But their lives were certainly a little more radioactive than the average American’s. The children of Richland, a quaint government-run village, lived a few miles south of the Hanford site — the spot where uranium was refined into a “slug” to be expelled from Fat Man, the bomb eventually dropped on Nagasaki, Japan. While this is old news and no one jokes much about the giant science project executed upriver anymore, the remnants of my hometown’s nuclear legacy remain. Sure, there’s the nuclear generating station that powers much of the Northwest and the robust research community at Pacific Northwest National Laboratory. But there’s also the Richland High School mascot — the Bombers — and the artistically rendered mushroom clouds blowing all across town. Today, visitors to Richland can take a hardhat tour of the Hanford B Reactor, where the first uranium slugs were manufactured. They can also partake in the American West’s unique nuclear tourism economy by drinking at the Atomic Brewpub & Eatery, licking up the ice cream at the Bombers Drive Thru, or hitting a strike at Atomic Bowl. For more on Richland’s story, “Atomic Town,” my audio story from Scienceline. In just five minutes, it explores the war effort’s legacy in the inland West through the story of the Richland High School Bombers mascot. Before the glitz and glam of the strip, Vegas itself was a quintessential atomic town. Locals and tourists stayed up all night partying, sure, but they did it so they could see the faint lights of atomic testing taking place out in the desert. And the earliest beauty pageants? They were all about finding the perfect Miss Atomic Bomb. Today, the only real remnant of this nuclear legacy is Las Vegas’s National Atomic Testing Museum — and a spooky city on the outskirts of town. The West is full of ghost towns, abandoned saloons and empty Westworld-esque sets. But none are quite like Nye County’s, which was never meant for humans in the first place. Instead, the Atomic Survival Town was populated by handsome mannequin families and their 1955 model homes and then blasted by 14 nuclear explosions. “Operation Teacup,” as it was called, was a way for the U.S. military to understand the effect of atomic weapons on cities and citizens. The mangled houses can be toured today. And while you’re in the area, stop by the BREN tower, which simulated the nuclear fallout of the bomb dropped on Hiroshima, the Yucca Mountain Repository, intended to store nuclear waste for 10,000 years and the Sedan Crater, created by underground nuclear testing. You can also snap a shot of the outer gates of Area 51, which may not be explicitly atomic but hey, who really knows? The 17th century poet John Donne once began a sonnet with the words, “Batter my heart, three person’d God.” A few hundred years later, physicist J. Robert Oppenheimer cited this passage as his inspiration for assigning the first atomic weapon ever detonated the code name Trinity. At 5:29:21 a.m., give or take two seconds, Trinity exploded and instantly turned the desert sand into a sickly green glass. 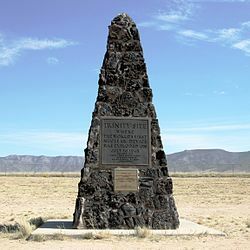 Today, an obelisk stands at the remote test site as a monument to the fury that was unleashed there. It is occasionally opened to the public, but only on the first Saturday in April. For everyone else, a historic marker has been placed along the highway. The last stop on this tour is Albuquerque, New Mexico, home to the National Museum of Nuclear Science & History. Chartered by Congress, it’s the final word (at least in the U.S.) on everything from mushroom cloud bathing suits to the science of the uranium cycle. 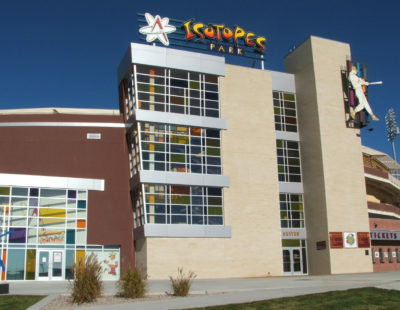 While they’re in town, visitors can also watch the local baseball team, the Albuquerque Isotopes, play. Now what’s a better way to end the summer? When Berlin was being bombed by the Allies, Atomic Physicists Heisenberg and Weizsäcker moved their operation to Haigerloch, near Stuttgart. Behind a pub in a deep cave, they set up their experimental reactor. You can go into the cave and look right down into the hole. It is super interesting, and there is a cool church above on the rocky cliff, that was spared destruction, when residents of the town made an appeal to the American Forces, ready to destroy the whole area.